A local organization representing Crestone and its environs. Where building an inclusive community is an art, inspiring a connection to the natural world, creativity and spirituality. Monthly features on community and history of Crestone; spiritual centers; environmental issues. Good source for lodging and special events. Monthly publication, online and hardcopy available. The only Green Burial Cemetery in Colorado. Providing Hospice and Palliative Care services throughout the San Luis Valley. Helen Lester, Director. Outdoor Hot Springs and Spa; lodging and conference center. Dedicated to land conservation and preserving natural resources, home of Valley View Hot Springs and Historic Orient Mine. Visit our Home Funerals page for a list of local artisans and businesses who can supply materials for a home funeral. 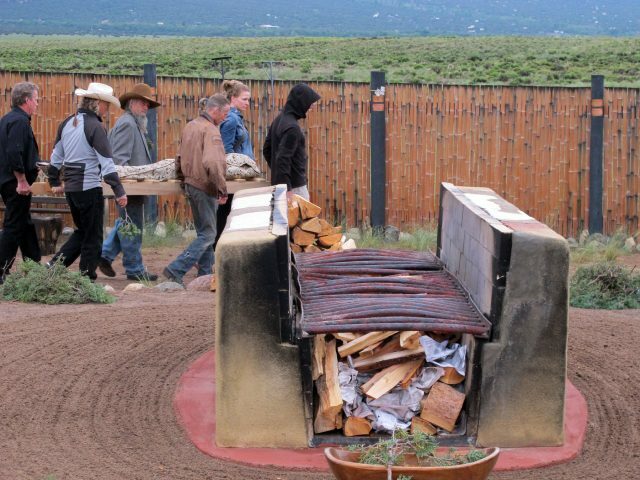 Sunday, April 28 from 1 to 4 pm: Come learn all about the Crestone End of Life Project (CEOLP), its history and how it works, including a guided visit to the beautiful open-air cremation site. The free event begins at the Crestone Baca POA meeting hall and continues at the nearby pyre site. It is hosted by the local non-profit CEOLP and its educational outreach branch, Informed Final Choices (IFC). CEOLP facilitates the only legal, non-denominational, community-based open-air cremation site in the country. Meet at the POA hall, where CEOLP/IFC founder and director Stephanie Gaines will speak and answer questions about CEOLP’s history. Other volunteers will talk about the pyre site and the roles of volunteer teams that make CEOLP’s service possible, from the time of a registrant’s death to the gathering of ashes after a cremation. Open Air, a short film by Adam Sekular about the cremation of a beloved community member, will be shown. The event then moves to the pyre site, which will be set up as it is in preparation for a cremation. CEOLP volunteers will be on hand to answer questions and share personal insights. For more information, contact Kelley Michelle (phone or text) at (719) 431-1339 or ceolp.info@gmail.com. Also visit informedfinalchoices.org. Save the Date: Colorado’s 1st Holistic Funeral Home. After my near-death experience, I lost my fear of death. I didn’t expect to feel so blindsided when my son got leukemia.